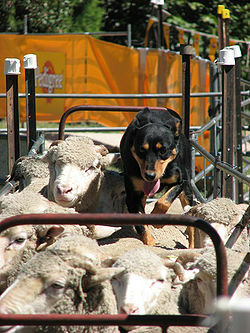 Dogs and sheep were among the first animals to be domesticated. Domestication is a sustained multi-generational relationship in which one group of organisms assumes a significant degree of influence over the reproduction and care of another group to secure a more predictable supply of resources from that second group. Charles Darwin recognized the small number of traits that made domestic species different from their wild ancestors. He was also the first to recognize the difference between conscious selective breeding in which humans directly select for desirable traits, and unconscious selection where traits evolve as a by-product of natural selection or from selection on other traits. There is a genetic difference between domestic and wild populations. There is also such a difference between the domestication traits that researchers believe to have been essential at the early stages of domestication, and the improvement traits that have appeared since the split between wild and domestic populations. Domestication traits are generally fixed within all domesticates, and were selected during the initial episode of domestication of that animal or plant, whereas improvement traits are present only in a proportion of domesticates, though they may be fixed in individual breeds or regional populations. The dog was the first domesticated vertebrate, and was established across Eurasia before the end of the Late Pleistocene era, well before cultivation and before the domestication of other animals. The archaeological and genetic data suggest that long-term bidirectional gene flow between wild and domestic stocks – including donkeys, horses, New and Old World camelids, goats, sheep, and pigs – was common. Given its importance to humans and its value as a model of evolutionary and demographic change, domestication has attracted scientists from archaeology, palaeontology, anthropology, botany, zoology, genetics, and the environmental sciences. Among birds, the major domestic species today is the chicken, important for meat and eggs, though economically valuable poultry include the turkey, guineafowl and numerous other species. Birds are also widely kept as cagebirds, from songbirds to parrots. The longest established invertebrate domesticates are the honey bee and the silkworm. Terrestrial snails are raised for food, while species from several phyla are kept for research, and others are bred for biological control. 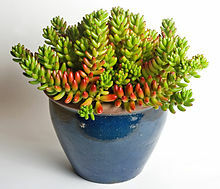 Succulents like this jelly bean plant (Sedum rubrotinctum) need infrequent watering, making them convenient as houseplants. Domestication, from the Latin domesticus, 'belonging to the house', is "a sustained multi-generational, mutualistic relationship in which one organism assumes a significant degree of influence over the reproduction and care of another organism in order to secure a more predictable supply of a resource of interest, and through which the partner organism gains advantage over individuals that remain outside this relationship, thereby benefitting and often increasing the fitness of both the domesticator and the target domesticate." This definition recognizes both the biological and the cultural components of the domestication process and the impacts on both humans and the domesticated animals and plants. All past definitions of domestication have included a relationship between humans with plants and animals, but their differences lay in who was considered as the lead partner in the relationship. This new definition recognizes a mutualistic relationship in which both partners gain benefits. Domestication has vastly enhanced the reproductive output of crop plants, livestock, and pets far beyond that of their wild progenitors. Domesticates have provided humans with resources that they could more predictably and securely control, move, and redistribute, which has been the advantage that had fueled a population explosion of the agro-pastoralists and their spread to all corners of the planet. Houseplants and ornamentals are plants domesticated primarily for aesthetic enjoyment in and around the home, while those domesticated for large-scale food production are called crops. Domesticated plants deliberately altered or selected for special desirable characteristics are cultigens. Animals domesticated for home companionship are called pets, while those domesticated for food or work are known as livestock. This biological mutualism is not restricted to humans with domestic crops and livestock but is well-documented in nonhuman species, especially among a number of social insect domesticators and their plant and animal domesticates, for example the ant–fungus mutualism that exists between leafcutter ants and certain fungi. Domestication syndrome is the suite of phenotypic traits arising during domestication that distinguish crops from their wild ancestors. The term is also applied to vertebrate animals, and includes increased docility and tameness, coat color changes, reductions in tooth size, changes in craniofacial morphology, alterations in ear and tail form (e.g., floppy ears), more frequent and nonseasonal estrus cycles, alterations in adrenocorticotropic hormone levels, changed concentrations of several neurotransmitters, prolongations in juvenile behavior, and reductions in both total brain size and of particular brain regions. The domestication of animals and plants began with the wolf (Canis lupus) at least 15,000 years before present (YBP), which then led to a rapid shift in the evolution, ecology, and demography of both humans and numerous species of animals and plants. The sudden appearance of the domestic dog (Canis lupus familiaris) in the archaeological record was followed by livestock and crop domestication, and the transition of humans from foraging to farming in different places and times across the planet. Around 10,000 YBP, a new way of life emerged for humans through the management and exploitation of plant and animal species, leading to higher-density populations in the centers of domestication, the expansion of agricultural economies, and the development of urban communities. A 2018 domestication study looked at the reasons why the archeological record that is based on the dating of fossil remains often differed from the genetic record contained within the cells of living species. The study concluded that our inability to date domestication is because domestication is a continuum and there is no single point where we can say that a species was clearly domesticated using these two techniques. The study proposes that changes in morphology across time and how humans were interacting with the species in the past needs to be considered in addition to these two techniques. The domestication of animals is the mutual relationship between animals with the humans who have influence on their care and reproduction. Charles Darwin recognized the small number of traits that made domestic species different from their wild ancestors. He was also the first to recognize the difference between conscious selective breeding in which humans directly select for desirable traits, and unconscious selection where traits evolve as a by-product of natural selection or from selection on other traits. There is a genetic difference between domestic and wild populations. There is also such a difference between the domestication traits that researchers believe to have been essential at the early stages of domestication, and the improvement traits that have appeared since the split between wild and domestic populations. Domestication traits are generally fixed within all domesticates, and were selected during the initial episode of domestication of that animal or plant, whereas improvement traits are present only in a proportion of domesticates, though they may be fixed in individual breeds or regional populations. Domestication of animals should not be confused with taming. Taming is the conditioned behavioral modification of an individual animal, to reduce its natural avoidance of humans, and to tolerate the presence of humans. Domestication is the permanent genetic modification of a bred lineage that leads to an inherited predisposition to respond calmly to human presence. Responses to humans and new environments, including reduced flight response and reactivity to external stimuli. The beginnings of animal domestication involved a protracted coevolutionary process with multiple stages along different pathways. It is proposed that there were three major pathways that most animal domesticates followed into domestication: (1) commensals, adapted to a human niche (e.g., dogs, cats, fowl, possibly pigs); (2) prey animals sought for food (e.g., sheep, goats, cattle, water buffalo, yak, pig, reindeer, llama and alpaca); and (3) targeted animals for draft and nonfood resources (e.g., horse, donkey, camel). The dog was the first domesticant, and was established across Eurasia before the end of the Late Pleistocene era, well before cultivation and before the domestication of other animals. Humans did not intend to domesticate animals from, or at least they did not envision a domesticated animal resulting from, either the commensal or prey pathways. In both of these cases, humans became entangled with these species as the relationship between them, and the human role in their survival and reproduction, intensified, leading eventually to a formalised animal husbandry. Although the directed pathway proceeded from capture to taming, the other two pathways are not as goal-oriented and archaeological records suggest that they took place over much longer time frames. Unlike other domestic species which were primarily selected for production-related traits, dogs were initially selected for their behaviors. The archaeological and genetic data suggest that long-term bidirectional gene flow between wild and domestic stocks – including donkeys, horses, New and Old World camelids, goats, sheep, and pigs – was common. One study has concluded that human selection for domestic traits likely counteracted the homogenizing effect of gene flow from wild boars into pigs and created domestication islands in the genome. The same process may also apply to other domesticated animals. 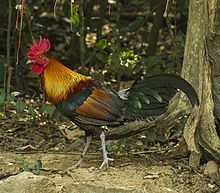 The red junglefowl of Southeast Asia was domesticated, apparently for cockfighting, some 7,000 years ago. Domesticated birds principally mean poultry, raised for meat and eggs: some Galliformes (chicken, turkey, guineafowl) and Anseriformes (waterfowl: duck, goose, swan). Also widely domesticated are cagebirds such as songbirds and parrots; these are kept both for pleasure and for use in research.Domestic pigeon is known as a messenger, research suggests it was domesticated as early as 10,000 years ago. Chickens were domesticated at least 7,000 years ago, with fossils in China from c. 5400 BCE. The chicken's wild ancestor is Gallus gallus, the red junglefowl of Southeast Asia. It appears to have been kept initially for cockfighting rather than for food. Two insects, the silkworm and the western honey bee, have been domesticated for over 5,000 years, often for commercial use. The silkworm is raised for the silk threads wound around its pupal cocoon; the western honey bee, for honey, and, lately, for pollination of crops. Several other invertebrates have been domesticated, both terrestrial and aquatic, including some such as Drosophila melanogaster fruit flies and the freshwater cnidarian Hydra for research into genetics and physiology. Few have a long history of domestication. Most are used for food or other products such as shellac and cochineal. The phyla involved are Cnidaria, Platyhelminthes (for biological control), Annelida, Mollusca, Arthropoda (marine crustaceans as well as insects and spiders), and Echinodermata. While many marine molluscs are used for food, only a few have been domesticated, including squid, cuttlefish and octopus, all used in research on behaviour and neurology. Terrestrial snails in the genera Helix and Murex are raised for food. Several parasitic or parasitoidal insects including the fly Eucelatoria, the beetle Chrysolina, and the wasp Aphytis are raised for biological control. Conscious or unconscious artificial selection has many effects on species under domestication; variability can readily be lost by inbreeding, selection against undesired traits, or genetic drift, while in Drosophila, variability in eclosion time (when adults emerge) has increased. The initial domestication of animals impacted most on the genes that controlled their behavior, but the initial domestication of plants impacted most on the genes that controlled their morphology (seed size, plant architecture, dispersal mechanisms) and their physiology (timing of germination or ripening). The domestication of wheat provides an example. Wild wheat shatters and falls to the ground to reseed itself when ripe, but domesticated wheat stays on the stem for easier harvesting. This change was possible because of a random mutation in the wild populations at the beginning of wheat's cultivation. Wheat with this mutation was harvested more frequently and became the seed for the next crop. Therefore, without realizing, early farmers selected for this mutation. The result is domesticated wheat, which relies on farmers for its reproduction and dissemination. The earliest human attempts at plant domestication occurred in the Middle East. There is early evidence for conscious cultivation and trait selection of plants by pre-Neolithic groups in Syria: grains of rye with domestic traits have been recovered from Epi-Palaeolithic (c. 11,050 BCE) contexts at Abu Hureyra in Syria, but this appears to be a localised phenomenon resulting from cultivation of stands of wild rye, rather than a definitive step towards domestication. By 10,000 BCE the bottle gourd (Lagenaria siceraria) plant, used as a container before the advent of ceramic technology, appears to have been domesticated. The domesticated bottle gourd reached the Americas from Asia by 8000 BCE, most likely due to the migration of peoples from Asia to America. Cereal crops were first domesticated around 9000 BCE in the Fertile Crescent in the Middle East. The first domesticated crops were generally annuals with large seeds or fruits. These included pulses such as peas and grains such as wheat. The Middle East was especially suited to these species; the dry-summer climate was conducive to the evolution of large-seeded annual plants, and the variety of elevations led to a great variety of species. As domestication took place humans began to move from a hunter-gatherer society to a settled agricultural society. This change would eventually lead, some 4000 to 5000 years later, to the first city states and eventually the rise of civilization itself. Continued domestication was gradual, a process of intermittent trial and error, and often resulted in diverging traits and characteristics. Over time perennials and small trees including the apple and the olive were domesticated. Some plants, such as the macadamia nut and the pecan, were not domesticated until recently. In other parts of the world very different species were domesticated. In the Americas squash, maize, beans, and perhaps manioc (also known as cassava) formed the core of the diet. In East Asia millet, rice, and soy were the most important crops. Some areas of the world such as Southern Africa, Australia, California and southern South America never saw local species domesticated. edible part larger, and easier separated from non-edible part (e.g. freestone fruit). There are many challenges facing modern farmers, including climate change, pests, soil salinity, drought, and periods with limited sunlight. Drought is one of the most serious challenges facing farmers today. With shifting climates comes shifting weather patterns, meaning that regions that could traditionally rely on a substantial amount of precipitation were, quite literally, left out to dry. In light of these conditions, drought resistance in major crop plants has become a clear priority. One method is to identify the genetic basis of drought resistance in naturally drought resistant plants, i.e. the Bambara groundnut. Next, transferring these advantages to otherwise vulnerable crop plants. Rice, which is one of the most vulnerable crops in terms of drought, has been successfully improved by the addition of the Barley hva1 gene into the genome using transgenetics. Drought resistance can also be improved through changes in a plant's root system architecture, such as a root orientation that maximizes water retention and nutrient uptake. There must be a continued focus on the efficient usage of available water on a planet that is expected to have a population in excess of nine-billion people by 2050. Another specific area of genetic improvement for domesticated crops is the crop plant's uptake and utilization of soil potassium, an essential element for crop plants yield and overall quality. A plant's ability to effectively uptake potassium and utilize it efficiently is known as its potassium utilization efficiency. It has been suggested that first optimizing plant root architecture and then root potassium uptake activity may effectively improve plant potassium utilization efficiency. Cereals, rice, wheat, corn, and barley, make up a huge amount of the global diet across all demographic and social scales. These cereal crop plants are all autogamous, i.e. self-fertilizing, which limits overall diversity in allelic combinations, and therefore adaptability to novel environments. To combat this issue the researchers suggest an "Island Model of Genomic Selection". By breaking a single large population of cereal crop plants into several smaller sub-populations which can receive "migrants" from the other subpopulations, new genetic combinations can be generated. The Bambara groundnut is a durable crop plant that, like many underutilized crops, has received little attention in an agricultural sense. The Bambara Groundnut is drought resistant and is known to be able to grow in almost any soil conditions, no matter how impoverished an area may be. New genomic and transcriptomic approaches are allowing researchers to improve this relatively small-scale crop, as well as other large-scale crop plants. The reduction in cost, and wide availability of both microarray technology and Next Generation Sequencing have made it possible to analyze underutilized crops, like the groundnut, at genome-wide level. Not overlooking particular crops that don't appear to hold any value outside of the developing world will be key to not only overall crop improvement, but also to reducing the global dependency on only a few crop plants, which holds many intrinsic dangers to the global population's food supply. The semi-arid tropics, ranging from parts of North and South Africa,Asia especially in the South Pacific, all the way to Australia are notorious for being both economically destitute and agriculturally difficult to cultivate and farm effectively. Barriers include everything from lack of rainfall and diseases, to economic isolation and environmental irresponsibility. There is a large interest in the continued efforts, of the International Crops Research Institute for the Semi-Arid Tropics (ICRSAT) to improve staple foods. some mandated crops of ICRISAT include the groundnut, pigeonpea, chickpea, sorghum and pearl millet, which are the main staple foods for nearly one billion people in the semi-arid tropics. 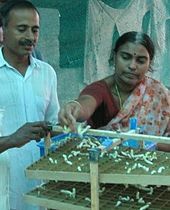 As part of the ICRISAT efforts, some wild plant breeds are being used to transfer genes to cultivated crops by interspecific hybridization involving modern methods of embryo rescue and tissue culture. One example of early success has been work to combat the very detrimental peanut clump virus. Transgenetic plants containing the coat protein gene for resistance against peanut clump virus have already been produced successfully. Another region threatened by food security are the Pacific Island Countries, which are disproportionally faced with the negative effects of climate change. The Pacific Islands are largely made up of a chain of small bodies of land, which obviously limits the amount of geographical area in which to farm. This leaves the region with only two viable options 1.) increase agricultural production or 2.) increase food importation. The latter of course runs into the issues of availability and economic feasibility, leaving only the first option as a viable means to solve the region's food crisis. It is much easier to misuse the limited resources remaining, as compared with solving the problem at its' core. Work has also has been focusing on improving domestic crops through the use of crop wild relatives. The amount and depth of genetic material available in crop wild relatives is larger than originally believed, and the range of plants involved, both wild and domestic, is ever expanding. Through the use of new biotechnological tools such as genome editing, cisgenesis/intragenesis, the transfer of genes between crossable donor species including hybrids, and other omic approaches. Wild plants can be hybridized with crop plants to form perennial crops from annuals, increase yield, growth rate, and resistance to outside pressures like disease and drought. It is important to remember that these changes take significant lengths of time to achieve, sometimes even decades. However, the outcome can be extremely successful as is the case with a hybrid grass variant known as Kernza. Over the course of nearly three decades, work was done on an attempted hybridization between an already domesticated grass strain, and several of its wild relatives. The domesticated strain as was more uniform in its orientation, but the wild strains were larger and propagated faster. The resulting Kernza crop has traits from both progenitors: uniform orientation and a linearly vertical root system from the domesticated crop, along with increased size and rate of propagation from the wild relatives. Button mushrooms are widely cultivated for food. Several species of fungi have been domesticated for use directly as food, or in fermentation to produce foods and drugs. 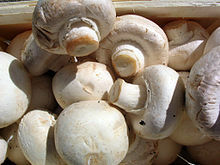 The white button mushroom Agaricus bisporus is widely grown for food. The yeast Saccharomyces cerevisiae have been used for thousands of years to ferment beer and wine, and to leaven bread. Mould fungi including Penicillium are used to mature cheeses and other dairy products, as well as to make drugs such as antibiotics. Selection of animals for visible "desirable" traits may have undesired consequences. Captive and domesticated animals often have smaller size, piebald color, shorter faces with smaller and fewer teeth, diminished horns, weak muscle ridges, and less genetic variability. Poor joint definition, late fusion of the limb bone epiphyses with the diaphyses, hair changes, greater fat accumulation, smaller brains, simplified behavior patterns, extended immaturity, and more pathology are among the defects of domestic animals. All of these changes have been documented by archaeological evidence, and confirmed by animal breeders in the 20th century. In 2014, a study proposed the theory that under selection, docility in mammals and birds results partly from a slowed pace of neural crest development, that would in turn cause a reduced fear–startle response due to mild neurocristopathy that causes domestication syndrome. The theory was unable to explain curly tails nor domestication syndrome exhibited by plants. A side effect of domestication has been zoonotic diseases. For example, cattle have given humanity various viral poxes, measles, and tuberculosis; pigs and ducks have given influenza; and horses have given the rhinoviruses. Many parasites have their origins in domestic animals. [page needed] The advent of domestication resulted in denser human populations which provided ripe conditions for pathogens to reproduce, mutate, spread, and eventually find a new host in humans. Paul Shepard writes "Man substitutes controlled breeding for natural selection; animals are selected for special traits like milk production or passivity, at the expense of overall fitness and nature-wide relationships...Though domestication broadens the diversity of forms – that is, increases visible polymorphism – it undermines the crisp demarcations that separate wild species and cripples our recognition of the species as a group. Knowing only domestic animals dulls our understanding of the way in which unity and discontinuity occur as patterns in nature, and substitutes an attention to individuals and breeds. The wide variety of size, color, shape, and form of domestic horses, for example, blurs the distinction among different species of Equus that once were constant and meaningful." 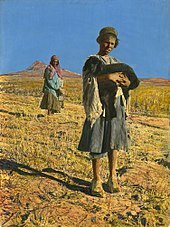 Some anarcho-primitivist authors describe domestication as the process by which previously nomadic human populations shifted towards a sedentary or settled existence through agriculture and animal husbandry. They claim that this kind of domestication demands a totalitarian relationship with both the land and the plants and animals being domesticated. They say that whereas, in a state of wildness, all life shares and competes for resources, domestication destroys this balance. Domesticated landscape (e.g. pastoral lands/agricultural fields and, to a lesser degree, horticulture and gardening) ends the open sharing of resources; where "this was everyone's", it is now "mine". Anarcho-primitivists state that this notion of ownership laid the foundation for social hierarchy as property and power emerged. It also involved the destruction, enslavement, or assimilation of other groups of early people who did not make such a transition. In 2016, a study found that humans have had a major impact on global genetic diversity as well as extinction rates, including a contribution to megafaunal extinctions. Pristine landscapes no longer exist and have not existed for millennia, and humans have concentrated the planet's biomass into human-favored plants and animals. Domesticated ecosystems provide food, reduce predator and natural dangers, and promote commerce, but have also resulted in habitat loss and extinctions commencing in the Late Pleistocene. Ecologists and other researchers are advised to make better use of the archaeological and paleoecological data available for gaining an understanding the history of human impacts before proposing solutions. ^ This Central Asian breed is ancient, dating perhaps to 1400 BCE. ^ a b c d Zeder, M.A. (2015). "Core questions in domestication Research". Proceedings of the National Academy of Sciences of the United States of America. 112 (11): 3191–98. Bibcode:2015PNAS..112.3191Z. doi:10.1073/pnas.1501711112. PMC 4371924. PMID 25713127. ^ a b Darwin, Charles (1868). The Variation of Animals and Plants under Domestication. London: John Murray. OCLC 156100686. ^ a b c d e Diamond, Jared (1997). Guns, Germs, and Steel: A short history of everybody for the last 13,000 years. London: Chatto and Windus. ISBN 978-0-09-930278-0. ^ a b Larson, G.; Piperno, D.R. ; Allaby, R.G. ; Purugganan, M.D. ; Andersson, L.; Arroyo-Kalin, M.; Barton, L.; Climer Vigueira, C.; Denham, T.; Dobney, K.; Doust, A.N. ; Gepts, P.; Gilbert, M.T. P.; Gremillion, K.J. ; Lucas, L.; Lukens, L.; Marshall, F.B. ; Olsen, K.M. ; Pires, J. C.; Richerson, P.J. ; Rubio De Casas, R.; Sanjur, O.I. ; Thomas, M.G. ; Fuller, D. Q. (2014). "Current perspectives and the future of domestication studies". Proceedings of the National Academy of Sciences. 111 (17): 6139–46. Bibcode:2014PNAS..111.6139L. doi:10.1073/pnas.1323964111. PMC 4035915. PMID 24757054. ^ a b c Olsen, K.M. ; Wendel, J.F. (2013). "A bountiful harvest: genomic insights into crop domestication phenotypes". Annu. Rev. Plant Biol. 64: 47–70. doi:10.1146/annurev-arplant-050312-120048. PMID 23451788. ^ a b c d Doust, A.N. ; Lukens, L.; Olsen, K.M. ; Mauro-Herrera, M.; Meyer, A.; Rogers, K. (2014). "Beyond the single gene: How epistasis and gene-by-environment effects influence crop domestication". Proceedings of the National Academy of Sciences. 111 (17): 6178–83. Bibcode:2014PNAS..111.6178D. doi:10.1073/pnas.1308940110. PMC 4035984. PMID 24753598. ^ a b c d e f g h i j Larson, G. (2014). "The Evolution of Animal Domestication" (PDF). Annual Review of Ecology, Evolution, and Systematics. 45: 115–36. doi:10.1146/annurev-ecolsys-110512-135813. ^ a b Meyer, Rachel S.; Purugganan, Michael D. (2013). "Evolution of crop species: Genetics of domestication and diversification". Nature Reviews Genetics. 14 (12): 840–52. doi:10.1038/nrg3605. PMID 24240513. ^ "Domestication". Encyclopædia Britannica. 2016. Retrieved May 26, 2016. ^ a b c d Larson, G. (2012). "Rethinking dog domestication by integrating genetics, archeology, and biogeography" (PDF). Proceedings of the National Academy of Sciences of the United States of America. 109 (23): 8878–8883. Bibcode:2012PNAS..109.8878L. doi:10.1073/pnas.1203005109. PMC 3384140. PMID 22615366. ^ a b Perri, Angela (2016). "A wolf in dog's clothing: Initial dog domestication and Pleistocene wolf variation". Journal of Archaeological Science. 68: 1–4. doi:10.1016/j.jas.2016.02.003. ^ a b c Marshall, F. (2013). "Evaluating the roles of directed breeding and gene flow in animal domestication". Proceedings of the National Academy of Sciences of the United States of America. 111 (17): 6153–6158. Bibcode:2014PNAS..111.6153M. doi:10.1073/pnas.1312984110. PMC 4035985. PMID 24753599. ^ a b Larson, G. (2013). "A population genetics view of animal domestication" (PDF). ^ "Domesticate". Oxford Dictionaries. Oxford University Press. 2014. ^ Zeder, M. (2014). "Domestication: Definition and Overview". In Smith, Claire (ed.). Encyclopedia of Global Archaeology. New York: Springer Science & Business Media. pp. 2184–94. doi:10.1007/978-1-4419-0465-2_71. ISBN 978-1-4419-0426-3. ^ Sykes, N. (2014). "Animal Revolutions". Beastly Questions: Animal Answers to Archaeological Issues. Bloomsbury Academic. pp. 25–26. ISBN 978-1-4725-0624-5. ^ a b c d e Zeder, M.A. (2012). "The domestication of animals". Journal of Anthropological Research. 68 (2): 161–90. doi:10.3998/jar.0521004.0068.201. ^ Hammer, K. (1984). "Das Domestikationssyndrom". Kulturpflanze. 32: 11–34. doi:10.1007/bf02098682. ^ a b Wilkins, Adam S.; Wrangham, Richard W.; Fitch, W. Tecumseh (July 2014). "The 'Domestication Syndrome' in Mammals: A Unified Explanation Based on Neural Crest Cell Behavior and Genetics" (PDF). Genetics. 197 (3): 795–808. doi:10.1534/genetics.114.165423. PMC 4096361. PMID 25024034. ^ a b c d Machugh, David E.; Larson, Greger; Orlando, Ludovic (2016). "Taming the Past: Ancient DNA and the Study of Animal Domestication". Annual Review of Animal Biosciences. 5: 329–351. doi:10.1146/annurev-animal-022516-022747. PMID 27813680. ^ Bocquet-Appel, J.P. (2011). "When the world's population took off: the springboard of the Neolithic Demographic Transition". Science. 333 (6042): 560–61. Bibcode:2011Sci...333..560B. doi:10.1126/science.1208880. PMID 21798934. ^ Irving-Pease, Evan K; Frantz, Laurent A.F. ; Sykes, Naomi; Callou, Cécile; Larson, Greger (2018). "Rabbits and the Specious Origins of Domestication". Trends in Ecology & Evolution. 33 (3): 149. doi:10.1016/j.tree.2017.12.009. PMID 29454669. ^ "Karakul". Breeds of Livestock. Oklahoma State University. Retrieved October 2, 2017. ^ Price, Edward O. (2008). Principles and applications of domestic animal behavior: an introductory text. Cambridge University Press. ISBN 978-1-78064-055-6. Retrieved January 21, 2016. ^ Driscoll, C.A. ; MacDonald, D.W.; O'Brien, S.J. (2009). "From wild animals to domestic pets, an evolutionary view of domestication". Proceedings of the National Academy of Sciences. 106: 9971–78. Bibcode:2009PNAS..106.9971D. doi:10.1073/pnas.0901586106. PMC 2702791. PMID 19528637. ^ Diamond, Jared (2012). "Chapter 1". In Gepts, P. (ed.). Biodiversity in Agriculture: Domestication, Evolution, and Sustainability. Cambridge University Press. p. 13. ^ Price, Edward O. (1984). "Behavioral aspects of animal domestication". Quarterly Review of Biology. 59 (1): 1–32. doi:10.1086/413673. JSTOR 2827868. ^ Price, Edward O. (2002). Animal domestication and behavior (PDF). Wallingford, UK: CABI Publishing. ^ Frantz, L. (2015). "The Evolution of Suidae". Annual Review of Animal Biosciences. 4: 61–85. doi:10.1146/annurev-animal-021815-111155. PMID 26526544. ^ Blaustein, R. (2015). "Unraveling the Mysteries of Animal Domestication:Whole-genome sequencing challenges old assumptions". BioScience. 65 (1): 7–13. doi:10.1093/biosci/biu201. ^ Vahabi, M. (2015). "Human species as the master predator". The Political Economy of Predation: Manhunting and the Economics of Escape. Cambridge University Press. p. 72. ISBN 978-1-107-13397-6. ^ Paul Gepts, ed. (2012). "9". Biodiversity in Agriculture: Domestication, Evolution, and Sustainability. Cambridge University Press. pp. 227–59. ^ Cagan, Alex; Blass, Torsten (2016). "Identification of genomic variants putatively targeted by selection during dog domestication". BMC Evolutionary Biology. 16: 10. doi:10.1186/s12862-015-0579-7. PMC 4710014. PMID 26754411. ^ Frantz, L. (2015). "Evidence of long-term gene flow and selection during domestication from analyses of Eurasian wild and domestic pig genomes". Nature Genetics. 47 (10): 1141–48. doi:10.1038/ng.3394. PMID 26323058. ^ Pennisi, E (2015). "The taming of the pig took some wild turns". Science. doi:10.1126/science.aad1692. ^ "Poultry". The American Heritage: Dictionary of the English Language. 4th edition. Houghton Mifflin Company. 2009. ^ "Avicultural Society of America". Avicultural Society of America. Retrieved March 25, 2017. ^ Blechman, Andrew (2007). Pigeons – The fascinating saga of the world's most revered and reviled bird. University of Queensland Press. ISBN 978-0-7022-3641-9. ^ Lawler, Andrew; Adler, Jerry (June 2012). "How the Chicken Conquered the World". Smithsonian Magazine (June 2012). ^ Bailey, Leslie; Ball, B.V. (2013). Honey Bee Pathology. Elsevier. pp. 7–8. ISBN 978-1-4832-8809-3. ^ Gon III, Samuel M.; Price, Edward O. (October 1984). "Invertebrate Domestication: Behavioral Considerations". BioScience. 34 (9): 575–79. doi:10.2307/1309600. JSTOR 1309600. ^ a b Hillman, G.; Hedges, R.; Moore, A.; Colledge, S.; Pettitt, P. (2001). "New evidence of Lateglacial cereal cultivation at Abu Hureyra on the Euphrates". Holocene. 11 (4): 383–93. doi:10.1191/095968301678302823. ^ Erickson, D.L. ; Smith, B.D. ; Clarke, A.C.; Sandweiss, D.H.; Tuross, N. (December 2005). "An Asian origin for a 10,000-year-old domesticated plant in the Americas". Proceedings of the National Academy of Sciences of the United States of America. 102 (51): 18315–20. Bibcode:2005PNAS..10218315E. doi:10.1073/pnas.0509279102. PMC 1311910. PMID 16352716. ^ Hughes, N; Oliveira, HR; Fradgley, N; Corke, F; Cockram, J; Doonan, JH; Nibau, C (March 14, 2019). "μCT trait analysis reveals morphometric differences between domesticated temperate small grain cereals and their wild relatives". The Plant journal : for cell and molecular biology. doi:10.1111/tpj.14312. PMID 30868647. ^ Zeven, A.C.; de Wit, J. M. (1982). Dictionary of Cultivated Plants and Their Regions of Diversity, Excluding Most Ornamentals, Forest Trees and Lower Plants. Wageningen, Netherlands: Centre for Agricultural Publishing and Documentation. ^ Horton, Peter (2000). "Prospects for crop improvement through the genetic manipulation of photosynthesis: morphological and biochemical aspects of light capture". Journal of Experimental Botany. 51: 475–85. doi:10.1093/jexbot/51.suppl_1.475. JSTOR 23696526. ^ Mitra, Jiban (2001). "Genetics and genetic improvement of drought resistance in crop plants". Current Science. 80 (6): 758–63. JSTOR 24105661. ^ Forester; et al. (2007). "Root system architecture: Opportunities and constraints for genetic improvement of crops". Trends in Plant Science. 12 (10): 474–81. doi:10.1016/j.tplants.2007.08.012. PMID 17822944. ^ Wang, Yi; Wu, Wei-Hua (2015). "Genetic approaches for improvement of the crop potassium acquisition and utilization efficiency". Current Opinion in Plant Biology. 25: 46–52. doi:10.1016/j.pbi.2015.04.007. PMID 25941764. ^ Shion, Yabe; et al. (2016). "Island-model Genomic Selection for Long-term Genetic Improvement of Autogamous Crops". PLOS One. 11 (4): e0153945. doi:10.1371/journal.pone.0153945. PMC 4846018. PMID 27115872. ^ a b Khan, F; Azman, R; Chai, H.H; Mayes, S; Lu, C (2016). "Genomic and transcriptomic approaches towards the genetic improvement of an underutilized crops: the case of bambara groundnut". African Crop Science Journal. 24 (4): 429–58. doi:10.4314/acsj.v24i4.9. ^ Sharma, Kiran K.; Ortiz, Rodomiro (2000). "Program for the Application of Genetic Transformation for Crop Improvement in the Semi-Arid Tropics". In Vitro Cellular & Developmental Biology. 36 (2): 83–92. doi:10.1007/s11627-000-0019-1. ^ a b c Zhang, Hengyou; Mittal, Neha; Leamy, Larry J.; Barazani, Oz; Song, Bao-Hua (2016). "Back into the wild – Apply untapped genetic diversity of wild relatives for crop improvement". Evolutionary Applications. 10 (1): 5–24. doi:10.1111/eva.12434. PMC 5192947. PMID 28035232. ^ Kilian, B.; et al. (2010). "Accessing genetic diversity for crop improvement". Current Opinion in Plant Biology. 13 (2): 167–73. doi:10.1016/j.pbi.2010.01.004. PMID 20167531 – via ScienceDirect. ^ Lebot, Vincent (December 2013). "Coping with insularity: The need for crop genetic improvement to strengthen adaptation to climatic change and food security in the Pacific". Environment, Development and Sustainability. 15 (6): 1405–23. doi:10.1007/s10668-013-9445-1. ^ a b Morrell, Peter; et al. (2007). "Plant Domestication, a Unique Opportunity to Identify the Genetic Basis of Adaptation". National Academy of Sciences. 104 (Suppl 1): 8641–48. Bibcode:2007PNAS..104.8641R. doi:10.1073/pnas.0700643104. PMC 1876441. PMID 17494757. ^ a b c van Tassel, D.; DeHann, L. (2013). "Wild plants to the rescue: efforts to domesticate new, high-Yield, perennial grain crops require patience and persistence – but such plants could transform agriculture". American Scientist. ^ "Agaricus bisporus:The Button Mushroom". MushroomExpert.com. Retrieved March 25, 2017. ^ Legras, Jean-Luc; Merdinoglu, Didier; Cornuet, Jean-Marie; Karst, Francis (2007). "Bread, beer and wine: Saccharomyces cerevisiae diversity reflects human history". Molecular Ecology. 16 (10): 2091–102. doi:10.1111/j.1365-294X.2007.03266.x. PMID 17498234. ^ "Pfizer's work on penicillin for World War II becomes a National Historic Chemical Landmark". American Chemical Society. June 12, 2008. ^ Berry, R.J. (1969). "The Genetical Implications of Domestication in Animals". In Ucko, Peter J.; Dimbleby, G.W. (eds.). The Domestication and Exploitation of Plants and Animals. Chicago: Aldine. pp. 207–17. ^ Shepard, Paul (1973). "Chapter One: Ten Thousand Years of Crisis". The Tender Carnivore and the Sacred Game. University of Georgia Press. pp. 10–11. ^ Boyden, Stephen Vickers (1992). "Biohistory: The interplay between human society and the biosphere, past and present". Man and the Biosphere Series. 8 (supplement 173): 665. Bibcode:1992EnST...26..665.. doi:10.1021/es00028a604. ^ Boivin, Nicole L.; Zeder, Melinda A.; Fuller, Dorian Q.; Crowther, Alison; Larson, Greger; Erlandson, Jon M.; Denham, Tim; Petraglia, Michael D. (2016). "Ecological consequences of human niche construction: Examining long-term anthropogenic shaping of global species distributions". Proceedings of the National Academy of Sciences. 113 (23): 6388–96. doi:10.1073/pnas.1525200113. PMC 4988612. PMID 27274046. Halcrow, S.E. ; Harris, N.J.; Tayles, N.; Ikehara-Quebral, R.; Pietrusewsky, M. (2013). "From the mouths of babes: Dental caries in infants and children and the intensification of agriculture in mainland Southeast Asia". Am. J. Phys. Anthropol. 150 (3): 409–20. doi:10.1002/ajpa.22215. PMID 23359102. Hayden, B. (2003). "Were luxury foods the first domesticates? Ethnoarchaeological perspectives from Southeast Asia". World Archaeology. 34 (3): 458–69. doi:10.1080/0043824021000026459a. Marciniak, Arkadiusz (2005). Placing Animals in the Neolithic: Social Zooarchaeology of Prehistoric Farming Communities. London: UCL Press. ISBN 978-1-84472-092-7. Look up domestication or taming in Wiktionary, the free dictionary.